This weekend marks the opening of the Oregon men’s outdoor track and field season with the Oregon Preview meet. Scheduled to participate in the 100 meters are Oregon football players Dior Mathis and B.J. Kelley. I’ve always looked forward to following Oregon football players who participate in other varsity sports, particularly track and field. I thought for my first article for FishDuck that I would provide a brief history of Oregon athletes who participated in both football and track and field with success in both sports. By no means will I attempt to list here all the athletes who participated in both sports while at Oregon. Last August, Kurt Liedtke wrote a wonderful article on several athletes who came to Oregon as track and field competitors but developed into outstanding football players. These athletes include J.J. Birden, Ronnie Harris, Patrick Johnson, Jordan Kent, and Samie Parker. I’ll use as my starting point a couple of football players from the late 1980’s and early 1990’s who were significant contributors in both football and track and field: Latin Berry and Muhammad Oliver. Latin Berry came to Oregon in 1985 as a tailback from Milwaukee, Oregon. In addition to being a three-year starter in football at Milwaukee High School, Latin was an outstanding track and field performer in the long jump and triple jump. He set a state record in the triple jump of 50-8 ¼. Following a redshirt year in 1985, Berry played his redshirt freshman year as a tailback and fullback before moving full-time to fullback, where he was a starter for three seasons. Subsequent to his college football career, Latin was drafted by the Los Angeles Rams for whom he played safety in 1990, and later spent the 1991 and 1992 seasons with the Cleveland Browns as a safety. While at Oregon, Latin competed for the Ducks track and field team in the long jump and triple jump from 1986 through the 1990 season. During each of those four seasons Berry was named an All-America. He still holds the Oregon outdoor record in the long jump and has the second longest triple jump in Oregon history. He also has the fifth best mark in the indoor long jump. Muhammad Oliver came to Oregon in 1990 from Glendale Community College where he had been a cornerback for two seasons. In 1989, Oliver finished second in the decathlon at the National Junior College Championships. As a Duck football player, Oliver started at cornerback in 1990 and 1991. He also participated in the decathlon for Oregon in 1991 and 1992, being named an All-America in 1992. Muhammad has the third highest point total in the decathlon in Oregon history, the eighth-best high jump mark, and the fastest indoor 50-meter hurdle time. Following his career at Oregon, Oliver was drafted by the Denver Broncos for whom he played in 1992. 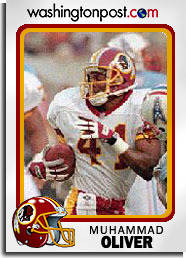 He also played for the Kansas City Chiefs, Green Bay Packers, Miami Dolphins, and Washington Redskins. Going back to 1978, Oregon recruited Don Coleman from Pima Junior College. At Pima, Coleman had first been a basketball player who became a track and field sprinter. In fact, Coleman who was in his late twenties when he arrived at Oregon had not played football in 10 years. As a junior, Coleman did not get many touches of the football but when he did it was pretty spectacular. He averaged 16.5 yards on four rushes, with a 59 yard touchdown run, and 33.7 yards on three receptions. As a senior he became a starting wide receiver. Following his senior season, Don was drafted in the 8th round by the Denver Broncos. Coleman, as a track and field athlete, still holds the Oregon record in the 100-meters, and is tied with Pat Johnson for the fastest 200-meter time. During the time Coleman was at Oregon, Vince Goldsmith was also playing football and competing in track and field. Vince started as a true freshman at nose guard and moved to defensive tackle for his last three seasons, being named an All-America in 1980. Goldsmith was a member of the track and field team from 1978 through 1981, competing in the shot put. He still has the sixth longest shot put in Oregon history. While considered too small to play in the NFL, Goldsmith enjoyed a long and successful career in the Canadian Football League, playing for the Calgary Stampeders, Saskatchewan Roughriders, and Toronto Argonauts. From 1960 through 1965, Oregon’s men’s track and field team was one of the best in the United States. In fact, some might consider this six year period to be the “Golden Age” of Oregon track and field. Oregon won three NCAA team championships, and finished second, third and fourth in the other three seasons. Several football players were key performers for the track and field team, particularly in 1962 when Oregon won its first team championship. Mel Renfro in his only season as a track and field competitor was named an All-America. He finished second in the 120-yard hurdles and third in the long jump at the NCAA championships. Mel also has the second fastest hand-timed 110-meter hurdles. Most fans will remember Renfro for his exploits on the football field, first at Oregon where he was an All-America halfback on offense and a great defensive back, and later with the Dallas Cowboys as a Hall of Fame safety. Another member of the 1962 track and field team was Jerry Tarr. Tarr came to Oregon from Bakersfield Junior college in 1960. He was a part-time starter as an end on the 1960 football team. However, Tarr’s real talent was on the track. 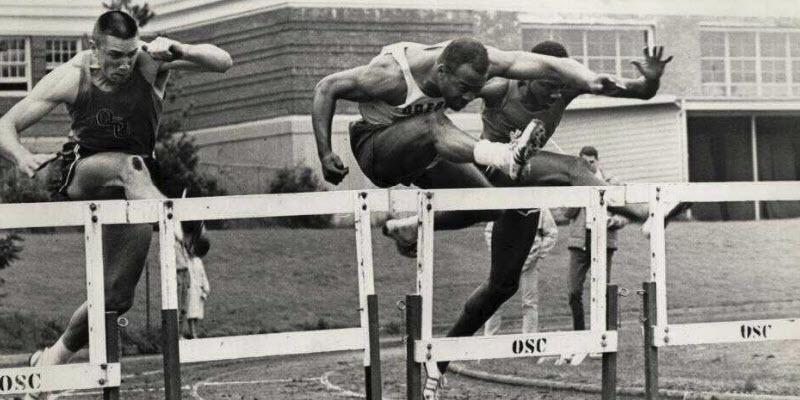 In his two seasons at Oregon, Jerry won the 1961 NCAA 120-yard hurdles championship, and won the 1962 NCAA 120-yard hurdles and 440-yard hurdles championships. He was named an All-America both seasons. The Denver Broncos drafted Tarr in the 17th round of the 1962 AFL draft. He played one season for the Broncos. There was a third football player on the 1962 track and field team, Mike Gaechter, who was also on the 1961 track and field team. Gaechter was a halfback and defensive back on the football team. He would go on to play eight years for the Dallas Cowboys, primarily as a strong safety. While Mike’s feats on the track did not rival those of Renfro or Tarr, he was involved in setting a world record. In 1962, Mel Renfro, Jerry Tarr, Mike Gaechter, and the great Harry Jerome set a world record in the 440-yard relay. Oregon’s 1959 football roster included Roscoe Cook. Apparently that was Cook’s only season on the football team. However, he was a member of the track and field team throughout his career at Oregon. In 1959, Cook set a world record in the 100-yard dash. That time still remains second on the Oregon list for 100-yard times. Also in 1959, Cook set a world indoor record in the 60-yard dash. He would set another world indoor record in the 60-yard dash in 1961. Cook was named an All-America in both 1959 and 1961. Most fans with a long memory will recall Jack Morris as an outstanding football player. However, Morris was also an outstanding track and field competitor for Oregon for three years from 1956 through 1958. As a football player, Morris first played for Oregon as a freshman in 1950. Following several years in the Air Force, he returned to Oregon in 1955 and for the next three seasons would be the starting fullback and linebacker. He also served as the Ducks place kicker and punter. Morris was drafted by the Los Angeles Rams originally in 1956. After leaving Oregon he would play defensive back for the Rams, Pittsburgh Steelers, and Minnesota Vikings. As a track and field competitor, Morris competed in the sprints and hurdles. He finished sixth in the 220-yard low hurdles at the 1957 NCAA Championships and was named an All-America. Emery Barnes only competed one season in track and field. However, he played football for Oregon in 1950, 1952 and 1953. He was named All-Pacific Coast Conference as a defensive end in 1952. Following his career at Oregon, he was drafted by the Green Bay Packers for whom he played in 1956. That, however, was not the end of Emery’s football career. In 1957, he moved to Canada where he played defensive tackle for the British Columbia Lions in 1957, and 1962-1964. Barnes would later become a politician in British Columbia. While he only competed in track and field for one season, it was a very successful season. Barnes won the 1952 NCAA high jump championship and was named an All-America in that sport. Finally, there is Ed Moeller who played fullback and quarterback for the Ducks from 1929 through 1931. He also was a member of the track and field team. He won the Pacific Coast Conference Northern Division championship in the discus in 1929 and 1931. Moeller set a world record in the discus in 1929.